If you’ve been looking for an easy and effective way to reuse those eco-unfriendly plastic bags, look no further than Easy Garbage. 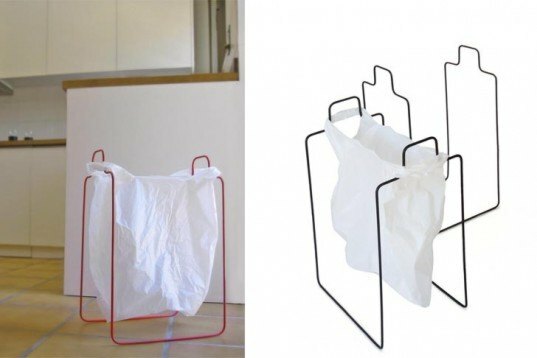 Created by Spanish design duo Javier Taberner Gomez-Ferrer and Nacho Poveda Lorenzo from Obj.studio, this linear dustbin is self-standing and will hold any size bag. Measuring 13 x 10 x 20 inches and formed in one continuous metallic wire, Easy Garbage is about as minimal as a design can be. Easy Garbage will hold any size bag making it easier and faster to reuse any plastic bag lying around in your kitchen drawers. With no walls and just a metal linear structure, it’s an eco-friendly alternative to traditional chunky dustbins. The structure can be carried around or hung from a wall by the handles and will adapt to any room of the house. Easy Garbage sells for 18,90 € and you can find it at Un4verde‘s website, a design collaborative for unique decorative objects by emerging Spanish designers. yeah...using plastic bags for garbage is probably the least eco-friendly you can go. So, you collect garbage in them and toss it out to a landfill? That only means you are going to delay them become garbage by a week or so. Designers should design for sustainability... re-use plastic bags to carry stuff in them and you can extend their life significantly farther. or even better don't accept them when offered. Even better would be to use biodegradable bags instead of plastic bags. Refuse the bags at the store, so you don't feel obligated to use it. If you've been looking for an easy and effective way to reuse those eco-unfriendly plastic bags, look no further than Easy Garbage. 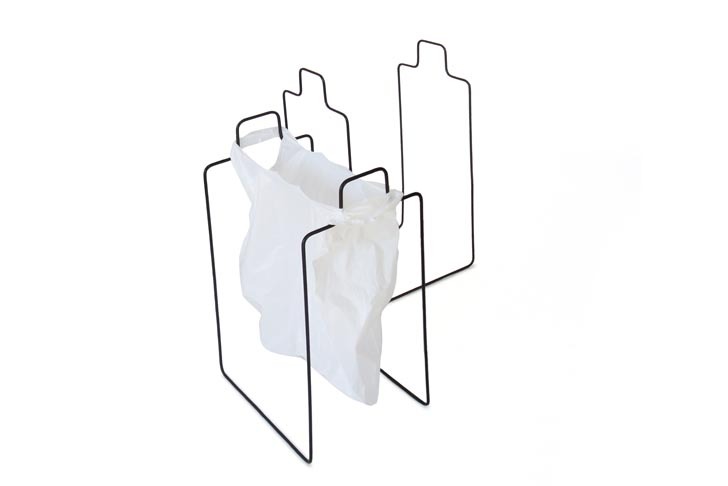 Created by Spanish design duo Javier Taberner Gomez-Ferrer and Nacho Poveda Lorenzo from Obj.studio, this linear dustbin is self-standing and will hold any size bag. Measuring 13 x 10 x 20 inches and formed in one continuous metallic wire, Easy Garbage is about as minimal as a design can be.